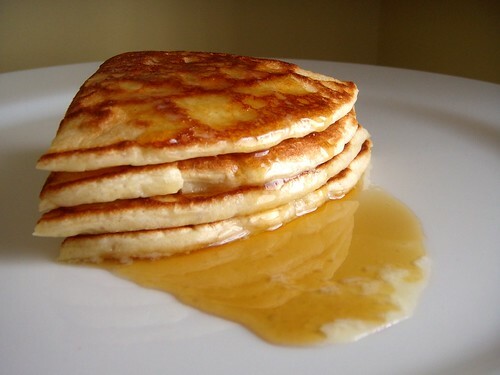 quarter-stack o' fluffy yogurt pancake, originally uploaded by aarn! +2nd March, 2009+. beat two eggs, added 1c. of yogurt (the more tart the better, lowfat was just fine), and 1/4c. of water. added the wet to a dry mix of 1c. of all purpose flour, 1 1/2t. baking powder, and 1t. salt, mixed well, but not violently, and let sit for 30-45min (wet:dry should be about 2c.:1c.). delivered to a hot buttered skillet with a ladle, scooping from the bottom of the bowl (making sure to not disrupt the trapped bubbles), and shook the skillet slightly to settle the pancake. cooked until the edges of the pancake were barely cooked on top and the bottom had some nice color, then flipped and cooked until crisp. waiting for enough pancakes to make a stack is boring and the 'cakes loose their taste and texture, the pancakes were sliced in quarters and stacked for the same effect. I love this picture! So unique and really makes you hungry for some fluffy pancakes! Just saw this on food gawker and had to come check out your site! So glad I did! Looks enticing, but 1T. in your recipe stays for what? TEA spoon, TABLE spoon, Thimble ... ?